Disclosure: I received a sample candle to conduct this LoveSpoon Candle review. The opinions stated are genuine and my own. The company LoveSpoon derives its name from the Welsh LoveSpoon, a beautifully carved wooden spoon, decorated with symbols of love. It is given as a wedding and anniversary gift, as well as for birthday, baby, Christmas, and Valentine’s Day celebrations. 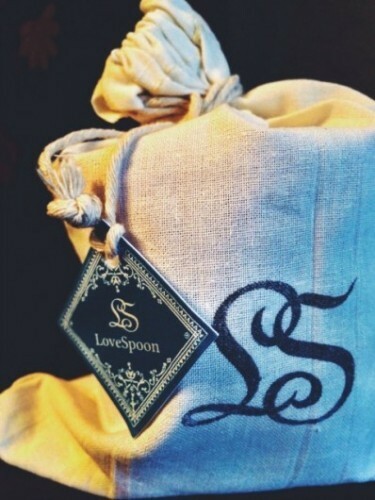 LoveSpoon Candles are handmade, using soy wax and wood or eco-friendly cotton wicks. LoveSpoon features four smell collections; Serenity Sensations, Exotic Essentials, Decadent Desires, and Festive Fragrances. Would my readers like this product? Does the price fit with the quality of the product? Does the product fulfill its advertised claims? What is the company’s story behind their brand/product, if applicable? Was there special attention given to how the product was made and/or packaged (eco-friendly, any special touches, etc.)? My overall impression of the LoveSpoon Candle was very positive. 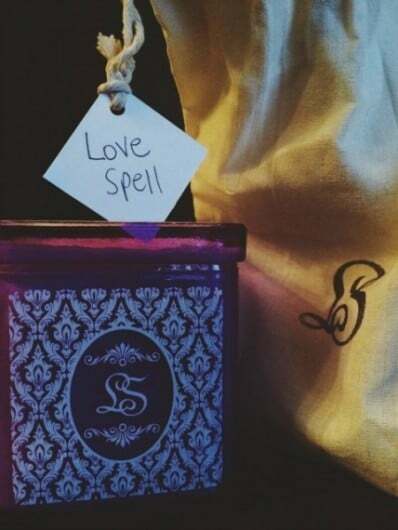 I received the “Love Spell” candle. It smells lovely with a nice combination of floral and fruity aromas and a hint of spice. I often get headaches from candles/smells and this candle did not cause any problems for me (awesome!). The particular candle I reviewed was from the Monogram Series ($19.95 each) which came in a colored, glass jar with the LoveSpoon monogram and a cotton eco-friendly wick. The price of the LoveSpoon Candles ranges from $19.95-$25.95, which falls within the range of prices I found during my research of other handmade soy candles of similar quality. One thing that stood out for me was the extra thought that obviously went into creating this product. The candle arrived in a lovely linen bag with the LoveSpoon monogram and a delightful tag with the name of the candle handwritten on the back (I found this be to a nice handmade touch). I also appreciated the use of wood and eco-friendly cotton wicks. In addition, LoveSpoon gives back to those in need and donates to a chosen charity at the end of each year. I did some research on the potential benefits of soy wax, and there are definitely different view points when it comes to candle making. Soy candle makers advertise that soy candles burn cleaner than paraffin wax candles. There are some who disagree with this statement. However, the majority of those who chimed in on this topic supported this claim. It also makes sense to me; soy is a renewable resources, versus paraffin which is usually derived from petroleum. You can purchase a candle or learn more about this company by visiting their website- LoveSpoon Candles. You can choose from their Cornerstone Collection which features candles in decorative tins with wood wicks that burn with a crackling sound, or a candle in a colored glass jar with a cotton eco-friendly wick from their Monogram Series. Here are some of their most popular candles; Cupid’s Arrow, Strawberry. Love Spell (this is the one I reviewed), Vanilla Bean, and Day at the Spa. Thank you for dropping by The Mindful Shopper! I absolutely LOVE it when you stop by! I hope you enjoyed my Lovespoon Candle Review! Valentine's Day Gifts with a Story... and a Giveaway! Goodness: Part II...and The Lots of Good Stuff Giveaway! Ha! Thanks for dropping in! That is a really beautiful candle. I love how it is packaged. I love the packaging as well! It adds such a nice touch! This would make a wonderful gift to give as a house warming or even just as a hostess gift. I love that it is presented in such a way that it stands out. I agree- great ideas! Thanks so much for stopping by! These candles are gorgeous! My daughter would love one! Glad to hear you think your daughter would love one! Thanks for stopping by! Candles are great gift ideas! They would be great for Valentine’s Day! I LOVE candles! This sounds great! 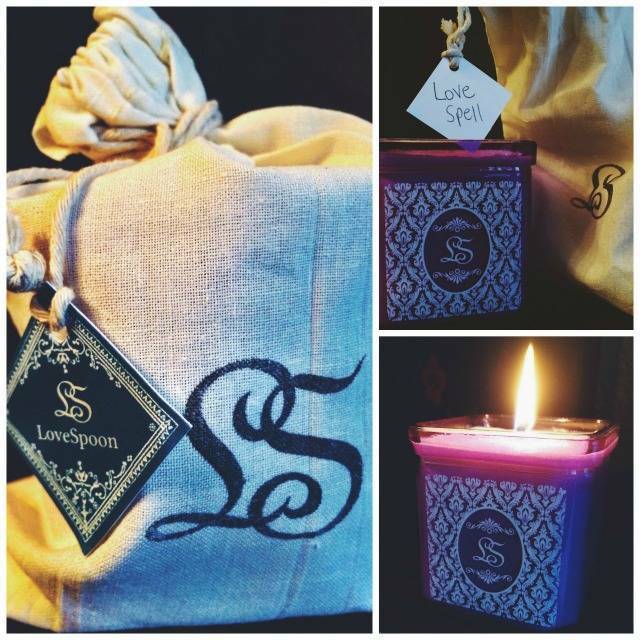 What a beautiful candle…I especially love the packaging! So pretty! Yes, the packaging definitely stood out for me! I always appreciate companies putting special care into all aspects of their products. Thank you for stopping by! I loooove candles! I always have one burning in my home! Thank you for sharing it! You are welcome! I love candles too! So comforting! Looks like a really awesome candle. I definitely would like to get one for the house. Thanks! It definitely is a fun candle! I love the homespun bag and handwritten tag. Those little details make this so gift-worthy. Yes, I totally agree! The little details are so important. Have a nice weekend! These candles are gorgeous! I love the little bag they come in! The little bag with the handwritten note definitely add a wonderful home-made touch. I love Vanilla Bean scents! I’ll have to get myself one! Soy candles are my favorite! It’s hard to find companies that sell them! Yes, I agree. These are lovely candles. My daughter loves candles! Her birthday is in just a few weeks and I bet she’d love a few of these! I am so glad to hear this! Hope your weekend is going well.